ON THIS PAGE: You will find some basic information about this disease and the parts of the body it may affect. This is the first page of Cancer.Net’s Guide to Childhood Brain Stem Glioma. Use the menu to see other pages. Think of that menu as a roadmap for this complete guide. Brain stem glioma is a type of central nervous system (CNS; brain and spinal cord) tumor that begins when healthy cells in the brain stem change and grow out of control, forming a mass called a tumor. A tumor can be cancerous or benign. A cancerous tumor is malignant, meaning it can grow and spread to other parts of the body. A benign tumor means the tumor can grow but will not spread. A glioma is a tumor that grows from a glial cell, which is a supportive cell in the brain. Usually, by the time brain stem glioma is diagnosed, it is most often diffuse, which means it has spread freely through the brain stem. This type of tumor is typically very aggressive, meaning that it grows and spreads quickly. A small percentage of brain stem tumors are very localized, called focal tumors. A focal tumor is often less likely to grow and spread quickly. Brain stem glioma occurs most commonly in children between 5 and 10 years old. Most brain stem tumors develop in the pons and grow in a part of the brain stem where it can be difficult to perform surgery, making brain stem glioma challenging to treat (see the Treatment Options section). 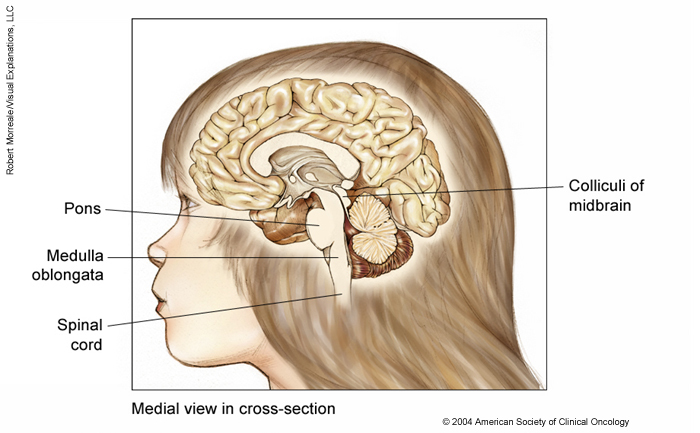 This section covers brain stem glioma diagnosed in children. Read more about brain tumors in adults. ASCO Answers Fact Sheet: Read a 1-page fact sheet that offers an introduction to CNS tumors. This fact sheet is available as a PDF, so it is easy to print. Cancer.Net En Español: Read about brain stem glioma in Spanish. Infórmase sobre el glioma de tronco encefálico en español. ON THIS PAGE: You will find out more about the factors that increase the chance of developing brain stem glioma. Use the menu to see other pages. Doctors and researchers don’t know what causes most childhood tumors, including brain stem glioma. There is some evidence that genetic factors may play a role in a small percentage of brain stem gliomas. Children with a brain stem glioma may experience the following symptoms or signs. Sometimes, children with a brain stem glioma do not have any of these changes. Or, the cause of a symptom may be a different medical condition that is not a brain stem glioma. If you are concerned about any changes your child experiences, please talk with your child’s doctor. The doctor will ask how long and how often your child has been experiencing the symptom(s), in addition to other questions. This is to help figure out the cause of the problem, called a diagnosis. If brain stem glioma is diagnosed, relieving symptoms remains an important part of care and treatment. This may also be called symptom management, palliative care, or supportive care. Be sure to talk with the health care team about the symptoms your child experiences, including any new symptoms or a change in symptoms. ON THIS PAGE: You will find a list of common tests, procedures, and scans that doctors use to find out the cause of a medical problem. Use the menu to see other pages. Doctors use many tests to find, or diagnose, a brain stem glioma. They also do tests to learn if the tumor has spread to another part of the body from where it started. If this happens, it is called metastasis. For example, imaging tests can show if the tumor has spread. Imaging tests show pictures of the inside of the body. Doctors may also do tests to learn which treatments could work best. For most tumors, a biopsy is the only sure way for the doctor to know whether an area of the body has a tumor. In a biopsy, the doctor takes a small sample of tissue for testing in a laboratory. In general, a biopsy is avoided in children with diffuse brain stem glioma because the results of the biopsy do not change treatment options and the procedure can have serious risks. However, a biopsy may be used in clinical trials or when a brain stem glioma has unusual features. By testing the part of the tumor removed during a biopsy, doctors may find certain molecular features that can help plan treatment. As new treatments based on this molecular information increase and the risk of a biopsy decreases, these procedures may be done more often. For most patients, diagnosing a brain stem glioma is done with magnetic resonance imaging (MRI) only (see below). Because of this, diffuse brain stem glioma is unlike most other tumors. For a focal tumor, a biopsy and removing the tumor with surgery may be considered. If a biopsy is not possible, the doctor may suggest other tests that will help make a diagnosis. MRI. An MRI uses magnetic fields, not x-rays, to produce detailed images of the body. A special dye called a contrast medium is given before the scan to create a clearer picture. This dye can be injected into a patient’s vein or given as a pill to swallow. Computed tomography (CT or CAT) scan. A CT scan creates a 3-dimensional picture of the inside of the body using x-rays taken from different angles. A computer combines these images into a detailed, cross-sectional view that shows any abnormalities or tumors. A CT scan can be used to measure the tumor’s size. Sometimes, a contrast medium is given before the scan to provide better detail on the image. This dye can be injected into a patient’s vein or given as a pill to swallow. For a brain stem glioma, this test generally does not provide enough information to make a definite diagnosis, and an MRI is still needed. Biopsy. A biopsy is the removal of a small amount of tissue for examination under a microscope. As explained above, a biopsy is generally not done for the more common, diffuse type of brain stem tumor. However, for a focal tumor, it is often used to find out the type of tumor. If possible, a doctor called a neurosurgeon will remove a small piece of tissue from the brain. A neurosurgeon specializes in treating a CNS tumor using surgery. A pathologist then analyzes the sample(s). A pathologist is a doctor who specializes in interpreting laboratory tests and evaluating cells, tissues, and organs to diagnose disease. After diagnostic tests are done, your child’s doctor will review all of the results with you. If the diagnosis is brain stem glioma, these results also help the doctor describe the tumor. This is called staging and grading. ON THIS PAGE: You will learn about how doctors describe the growth or spread of brain stem glioma. This is called the stage or grade. Use the menu to see other pages. Staging is a way of describing where the tumor is located, if or where it has spread, and whether it is affecting other parts of the body. Doctors use diagnostic tests to find out the tumor's stage, so staging may not be complete until all of the tests are finished. Knowing the stage helps the doctor to decide what kind of treatment is best and can help predict a patient's prognosis, which is the chance of recovery. There are different stage descriptions for different types of tumors. There is no formal staging system for childhood brain stem glioma. A tumor may be classified as either diffuse or focal. In addition, the tumor may be classified by its grade. Grade describes how much tumor cells look like healthy cells when viewed under a microscope. The doctor compares the tumor’s tissue with healthy tissue. Healthy tissue usually contains many different types of cells grouped together. If the tumor cells looks similar to healthy tissue and contains different cell groupings, it is called differentiated or a low-grade tumor. If the tumor tissue looks very different from healthy tissue, it is called poorly differentiated or a high-grade tumor. The tumor’s grade may help the doctor predict how quickly it will spread. In general, the lower the tumor’s grade, the better the prognosis. Diffuse brain stem glioma. This type of tumor spreads freely throughout the pons and often spreads to the midbrain, the medulla, or nearby parts of the brain. These tend to be high-grade tumors. They are very aggressive and contain abnormal-looking cells. If a biopsy was done, a diffuse brain stem glioma may be further classified by a specific genetic change in the tumor cells called H3 K27M. Focal brain stem glioma. About 20% of brain stem tumors are focal, meaning they occur in 1 area or are contained within a small portion of the brain stem. They usually occur in the midbrain or medulla, rather than the pons. These are usually benign or low-grade tumors. They are less aggressive and the tumor cells look more like healthy cells. Recurrent brain stem glioma: Recurrent brain stem glioma is a tumor that has come back after treatment. If the tumor does return, there will be another round of tests to learn about the extent of the recurrence. These tests and scans are often similar to those done at the time of the original diagnosis. Information about the tumor’s grade will help the doctor recommend a specific treatment plan. The next section in this guide is Treatment Options. You may use the menu to choose a different section to read in this guide. ON THIS PAGE: You will learn about the different treatments doctors use for children with brain stem glioma. Use the menu to see other pages. In general, tumors in children are uncommon. This means it can be hard for doctors to plan treatments unless they know what has been most effective in other children. That’s why more than 60% of children are treated as part of a clinical trial. A clinical trial is a research study that tests a new approach to treatment. The “standard of care” is the best treatments known. Clinical trials may test such approaches as a new drug, a new combination of standard treatments, or new doses of current therapies. The health and safety of all children participating in clinical trials are closely monitored. To take advantage of these newer treatments, children should be treated at a specialized cancer center. Doctors at these centers have extensive experience in treating children and have access to the latest research. A doctor who specializes in treating children with cancer is called a pediatric oncologist. For brain stem glioma, a neuro-oncologist may also be involved with treatment. A neuro-oncologist is a doctor who specializes in CNS tumors. If a pediatric cancer center is not nearby, general cancer centers sometimes have pediatric specialists who are able to be part of your child’s care. In many cases, a team of doctors works with a child and the family to provide care; this is called a multidisciplinary team. Pediatric cancer centers often have extra support services for children and their families, such as child life specialists, dietitians, physical and occupational therapists, social workers, and counselors. Special activities and programs to help your child and family cope may also be available. Descriptions of the most common treatment options for brain stem glioma are listed below. Treatment options and recommendations depend on several factors, including the type and grade of the tumor, possible side effects, the family’s preferences, and the child’s overall health. Your child’s care plan may also include treatment for symptoms and side effects, an important part of care. The types of treatments used for brain stem glioma in children include radiation therapy, chemotherapy, and surgery. Sometimes, these treatments are used together. The treatment of brain stem glioma for children with the genetic condition neurofibromatosis type 1 (NF1) may differ. A tumor in a child with NF1 may be low-grade even though it looks diffuse. Therefore, active surveillance or watchful waiting may be recommended. This approach is when the patient is closely monitored to watch for signs that the tumor is worsening. Treatment would begin if the tumor started to grow and spread. Take time to learn about all of your child’s treatment options and be sure to ask questions about things that are unclear. Talk with your child’s doctor about the goals of each treatment and what you can expect during the treatment. Learn more about making treatment decisions. Radiation therapy is the most common treatment for children with brain stem glioma. Radiation therapy is the use of high-energy x-rays or other particles to destroy tumor cells. A doctor who specializes in giving radiation therapy to treat a tumor is called a radiation oncologist. The most common type of radiation treatment is called external-beam radiation therapy, which is radiation given from a machine outside the body. A radiation therapy regimen, or schedule, usually consists of a specific number of treatments given over a set period of time. Proton beam therapy is a type of external-beam radiation therapy that uses protons rather than x-rays. It is a newer type of radiation therapy that may be an option for patients with brain stem glioma. At high energy, protons can destroy cancer cells. Side effects from radiation therapy may include fatigue, mild skin reactions, upset stomach, and loose bowel movements. Most side effects go away soon after treatment is finished. Because radiation therapy can sometimes cause problems with the growth and development of a child’s brain, the doctor may choose to treat the tumor in another way. To avoid or reduce the need for radiation therapy in young children, the doctor may first use chemotherapy (see below) to shrink the tumor. Chemotherapy is the use of drugs to destroy tumor cells, usually by ending the tumor cells’ ability to grow and divide. Chemotherapy is given by a medical oncologist, a doctor who specializes in treating a tumor with medication, or a pediatric oncologist. Chemotherapy by itself is not an effective treatment for brain stem glioma. Sometimes, a doctor may use chemotherapy before, at the same time as, or after radiation therapy. Learn more about the basics of chemotherapy and preparing for treatment. The medications used to treat brain stem glioma are continually being evaluated. Talking with your child’s doctor is often the best way to learn about the medications prescribed for your child, their purpose, and their potential side effects or interactions with other medications. Learn more about your child’s prescriptions by using searchable drug databases. Surgery is the removal of the tumor and some surrounding healthy tissue during an operation. A neurosurgeon is a doctor who specializes in treating a CNS tumor using surgery. Surgery is used to treat brain stem glioma only when the tumor looks focal on an MRI scan (see Diagnosis). This means that it may be possible to remove the tumor without damaging the brain, such as when a tumor grows out from the brain stem instead of into the brain stem. For most children with diffuse types of brain stem glioma, surgery is not recommended or possible because of the location of the tumor and the risk involved. Before surgery, talk with the health care team about the possible side effects from the specific surgery your child will have. Learn more about the basics of surgery. Brain stem glioma and its treatment often cause side effects. In addition to treatments intended to slow, stop, or eliminate the tumor, an important part of care is relieving a person’s symptoms and side effects. This approach is called palliative or supportive care. It includes supporting the patient with his or her physical, emotional, and social needs. Palliative care is any treatment that focuses on reducing symptoms, improving quality of life, and supporting patients and their families. Any person, regardless of age or type and stage of tumor, may receive palliative care. It works best when palliative care is started as early as needed in the treatment process. People often receive treatment for the tumor at the same time that they receive treatment to ease side effects. In fact, patients who receive both at the same time often have less severe symptoms, better quality of life, and families report they are more satisfied with treatment. Palliative treatments vary widely and often include medication, nutritional changes, relaxation techniques, emotional support, and other therapies. Your child may also receive palliative treatments similar to those meant to eliminate the tumor, such as chemotherapy, surgery, or radiation therapy. Talk with your child’s doctor about the goals of each treatment in the treatment plan. Before treatment begins, talk with your child’s health care team about the possible side effects of your specific treatment plan and palliative care options. During and after treatment, be sure to tell your child’s doctor or another health care team member if your child is experiencing a problem so it can be addressed as quickly as possible. Learn more about palliative care. A remission is when the tumor cannot be detected in the body and there are no symptoms. This may also be called having “no evidence of disease” or NED. A remission may be temporary or permanent. This uncertainty causes many people to worry that the tumor will come back. While many remissions are permanent, it’s important to talk with your child’s doctor about the possibility of the tumor returning. Understanding your child’s risk of recurrence and the treatment options may help you feel more prepared if the disease does return. Learn more about coping with the fear of recurrence. When this occurs, a new cycle of testing will begin again to learn as much as possible about the recurrence. After this testing is done, you and your child’s doctor will talk about the treatment options. Treatment for recurrent brain stem glioma depends on the type of tumor, such as whether it is diffuse or focal, and the type of treatment that was given for the original tumor. Depending on the situation, the doctor may recommend either surgery or chemotherapy. Your child’s doctor may suggest clinical trials that are studying new ways to treat this type of recurrent tumor. Whichever treatment plan you choose, palliative care will be important for relieving symptoms and side effects. A recurrent tumor may bring up emotions such as disbelief or fear. You and your family are encouraged to talk with the health care team about these feelings and ask about support services to help you cope. Learn more about dealing with a recurrence. Although treatment is successful for the majority of children with a tumor, sometimes it is not. If a child’s tumor cannot be cured or controlled, this is called an advanced or terminal tumor. This diagnosis is stressful, and advanced brain stem glioma may be difficult to discuss. However, it is important to have open and honest conversations with your child’s doctor and health care team to express your family’s feelings, preferences, and concerns. The health care team is there to help, and many team members have special skills, experience, and knowledge to support patients and their families. Hospice care is a type of palliative care for people who are expected to live less than 6 months. It is designed to provide the best possible quality of life for people who are near the end of life. Parents and guardians are encouraged to talk with the health care team about hospice options, which include hospice care at home, a special hospice center, or other health care locations. Nursing care and special equipment can make staying at home a workable option for many families. Some children may be happier if they can arrange to attend school part-time or keep up other activities and social connections. The child’s health care team can help parents or guardians decide on an appropriate level of activity. Making sure a child is physically comfortable and free from pain is extremely important as part of end-of-life care. Learn more about caring for a terminally ill child and advanced care planning. The next section in this guide is About Clinical Trials. It offers more information about research studies that are focused on finding better ways to care for children with a tumor. You may use the menu to choose a different section to read in this guide. ON THIS PAGE: You will read about the scientific research being done now to learn more about brain stem glioma and how to treat it. Use the menu to see other pages. Doctors are working to learn more about brain stem glioma, ways to prevent it, how to best treat it, and how to provide the best care to children diagnosed with this disease. The following areas of research may include new options for patients through clinical trials. Always talk with your child’s doctor about the best diagnostic and treatment options for your child. Improved imaging and surgery. Imaging techniques are being developed that help the surgical oncologist pinpoint the tumor’s exact location to reduce or prevent damage to the healthy parts of the brain. For example, image-guided stereotaxis allows surgeons to visualize and operate on the brain using 3-dimensional computerized outlines of the brain and the tumor. Along with specialized software, these images help guide the surgeon to the tumor. Tumors that were once considered inoperable can now be removed using this technique. In certain instances, these imaging techniques are also being used to better understand the benefits and risks of using a biopsy to diagnose children with diffuse brain stem glioma. Improved radiation therapy. Conformal radiation therapy is a way to give high doses of radiation therapy directly to a tumor and not healthy tissue. This technique creates detailed, 3-dimensional maps of the brain and the tumor so doctors know exactly where to deliver the radiation therapy. In addition, drugs designed to enhance the effectiveness of radiation therapy or to slow or stop tumor growth are also being studied. Molecular features. Other research is focused on evaluating the abnormal molecular features of brain stem glioma cells to better diagnosis and categorize these tumors. These features are found by examining the tumor after a biopsy and may help doctors find treatments that target the tumor based on the specific molecular features (see below). Targeted therapy. Targeted therapy is a treatment that targets the tumor’s specific genes, proteins, or the tissue environment that contributes to cancer growth and survival. This type of treatment blocks the growth and spread of tumor cells while limiting damage to healthy cells. For brain stem glioma, researchers are studying new treatments that targeted certain molecular features found in the tumor (see above). Learn more about the basics of targeted treatments. Immunotherapy. Immunotherapy, also called biologic therapy, is designed to boost the body's natural defenses to fight the cancer. It uses materials made either by the body or in a laboratory to improve, target, or restore immune system function. For brain stem glioma, doctors are researching vaccines that may treat the tumor. Learn more about the basics of immunotherapy and cancer vaccines. New ways to give chemotherapy. The blood-brain barrier, which protects the brain and spinal cord from damaging chemicals, also keeps out many types of chemotherapy. New methods of giving chemotherapy called convection-enhanced delivery are also being studied. This method uses a narrow tube called a catheter that is placed into the brain so chemotherapy can be directed at the tumor. Palliative care. Clinical trials are underway to find better ways of reducing symptoms and side effects of current brain stem glioma treatments to improve patients’ comfort and quality of life. Tissue donation. Some families find that donating tissue feels appropriate as part of the grieving process after their child’s death. Similar to organ donation, tissue donations can help researchers learn more about how tumors change and spread to help develop new treatments for children with brain stem glioma. Talk with your doctor for more information about tissue donation. ON THIS PAGE: You will read about your child’s medical care after treatment is finished and why this follow-up care is important. Use the menu to see other pages. Care for children diagnosed with brain stem glioma doesn’t end when active treatment has finished. Your child’s health care team will continue to check to make sure the tumor has not returned, manage any side effects, and monitor your child’s overall health. This is called follow-up care. All children treated for brain stem glioma should have life-long, follow-up care. Your child’s follow-up care may include regular physical examinations, medical tests, or both. Doctors want to keep track of your child’s recovery in the months and years ahead. Learn more about the importance of follow-up care. One goal of follow-up care is to check for a recurrence. A tumor recurs because small areas of tumor cells may remain undetected in the body. Over time, these cells may increase in number until they show up on test results or cause signs or symptoms. During follow-up care, a doctor familiar with your child’s medical history can give you personalized information about the risk of recurrence. Your doctor will ask specific questions about your child’s health. Some children may have blood tests or imaging tests as part of regular follow-up care, but testing recommendations depend on several factors, including the type and stage of tumor originally diagnosed and the types of treatment given. Radiation therapy to the brain and spine can cause cognitive and endocrine (hormonal) symptoms over time. The severity of these late effects vary depending on the dose given and your child’s age. The risks and possible side effects of surgery vary widely, depending on the location and features of the tumor. The risks of chemotherapy and the chance of a second cancer strongly depend on the specific drugs used and the doses. For each of these issues, it is important to discuss the specific aspects of the tumor and the options for treatment with the doctors that are involved in your child's care before, during, and after treatment. Follow-up care should also address your child’s quality of life, including any developmental or emotional concerns. The Children's Oncology Group (COG) has studied the physical and psychological effects that childhood cancer survivors face. Based on these studies, COG has created recommendations for long-term follow-up care for childhood, adolescent, and young adult cancer survivors that can be found on a separate website: www.survivorshipguidelines.org. You are encouraged to organize and keep a personal record of the child’s medical information. The doctor will help you create this. That way, as the child enters adulthood, he or she has a clear, written history of the diagnosis, the treatment given, and the doctor’s recommendations about the schedule for follow-up care. ASCO offers forms to help create a treatment summary to keep track of the treatment your child received and develop a survivorship care plan when treatment is completed. Some children continue to see their oncologist, while others transition back to the care of their family doctor or another health care professional. This decision depends on several factors, including the type and stage of tumor, side effects, health insurance rules, and your family’s personal preferences. Talk with your health care team about your child’s ongoing medical care and any concerns you have about his or her future health. If a doctor who was not directly involved in your child’s treatment for brain stem glioma will lead the follow-up care, be sure to share the treatment summary and survivorship care plan forms with him or her and with all future health care providers. Details about the specific treatment given are very valuable to the health care professionals who will care for your child throughout his or her lifetime. The next section in this guide is Survivorship. It describes how to cope with challenges in everyday life after a diagnosis of brain stem glioma. You may use the menu to choose a different section to read in this guide. Talking often with the health care team is important to make informed decisions about your child’s health care. These suggested questions are a starting point to help you learn more about your child’s care and treatment. You are also encouraged to ask additional questions that are important to you. You may want to print this list and bring it to your child’s next appointment, or download Cancer.Net’s free mobile app for a digital list and other interactive tools to manage your child’s care. What type of tumor has been diagnosed? Is the tumor diffuse or focal? What does this mean? Are other tests needed to confirm this diagnosis? What is your familiarity with my child’s tumor type and its treatment? What clinical trials are available for my child at this center? How do I find out more about them? What new research is being done at other treatment centers? Where are they located? Are these clinical trials open to my child? What is the goal of each treatment? Is it to eliminate the tumor, help my child feel better, or both? What are the chances for success with the planned treatments? Could this treatment affect my child’s ability to become pregnant or have children in the future? If so, should I talk with a fertility specialist before treatment begins? What type of surgery will my child have? Can you describe what recovery from surgery will be like? What long-term side effects or late effects are possible based on the treatment my child received? How do I get a treatment summary and survivorship care plan to keep in my child’s records?